Basketball season officially gets underway in full force for all of the Bryant teams this week highlighted by the rivalry between Bryant and Benton in high school action on Thursday. Play starts tonight with Bethel Middle School (Bryan Blue) teams traveling to The Anthony School in Little Rock. A seventh-grade girls game will get things started at 4:30 p.m., followed by an eighth-grade girls contest and an eighth-grade boys meeting. This year, the Bryant Blue girls will be coached by Derek McGrew who has coached the boys over the last few years. McGrew was a highly successful coach of both boys and girls teams at Paron High School before it was consolidated into the Bryant School District. The boys have a new coach in Dominic Lincoln. Bryant Middle School (Bryant White) teams debut on Tuesday at the BMS gym against their respective counterparts from Sheridan. Both seventh grade teams and both eighth grade teams will compete starting at 4:30 p.m.
Thursday, not only will the Bryant High School teams be in action, starting with the varsity girls game at 6, the freshman teams and the Bryant White girls eighth grade team travel to Watson Chapel for games starting at 5. In addition, the Bryant White seventh grade teams will host North Little Rock middle school teams with the girls game starting at 5. 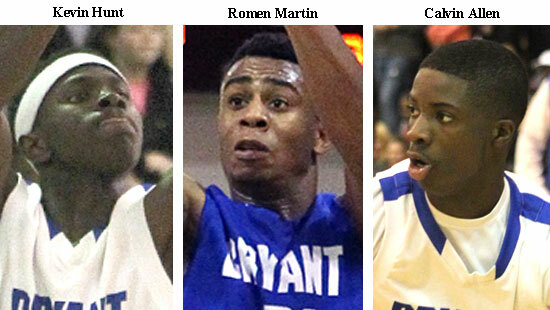 Bryant Blue was scheduled to play at Little Rock Episcopal but due to a scheduling conflict the games were postponed. For complete schedules for all the teams, go here.